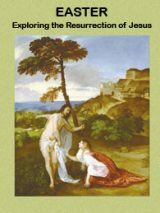 This Bible History Daily feature was originally published in March 2013.—Ed. 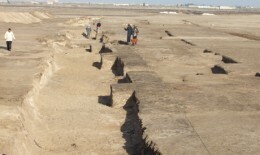 Excavations at Tel Habuwa, thought to be ancient Tjaru, reveal evidence of the expulsion of the Hyksos by Ahmose I at the end of the Second Intermediate Period. In the Second Intermediate Period (18th–16th centuries B.C.E. ), towards the end of the Middle Bronze Age, the West Asian (Canaanite) Hyksos controlled Lower (Northern) Egypt. In the 16th century, Ahmose I overthrew the Hyksos and initiated the XVIII dynasty and the New Kingdom of Egypt. Recent archaeological discoveries at Tel Habuwa (also known as Tell el-Habua or Tell-Huba), a site associated with ancient Tjaru (Tharo), shed new light on Ahmose’s campaign. A daybook entry in the famous Rhind Mathematical Papyrus notes that Ahmose seized control of Tjaru before laying siege the Hyksos at their capital in Avaris. Excavations at the site, located two miles east of the Suez Canal, have uncovered evidence of battle wounds on skeletons discovered in two-story administrative structures dating to the Hyksos and New Kingdom occupations. The site showed evidence of burned buildings, as well as massive New Kingdom grain silos that would have been able to feed a large number of Egyptian troops. After Ahmose took the city and defeated the Hyksos, he expanded the town and built several nearby forts to protect Egypt’s eastern border. Tjaru was first discovered in 2003, but until now, the excavation only uncovered the New Kingdom military fort and silos. This new discovery confirms a decisive moment in the expulsion of the Hyksos previously known from textual sources. Josephus identifies the Israelite Exodus with the expulsion of the Hyksos “shepherd kings.” Read more about archaeological evidence for the Israelites in Egypt and new scholarship on the Exodus in our FREE eBook Ancient Israel in Egypt and the Exodus. The Hyksos are well known from ancient texts, and their expulsion was recorded in later ancient Egyptian historical narratives. The third-century B.C.E. Egyptian historian Manetho–whose semi-accurate histories stand out as valuable resources for cataloging Egyptian kingship–wrote of the Hyksos’ violent entry into Egypt from the north, and the founding of their monumental capital at Avaris, a city associated with the famous excavations at Tell ed-Dab’a. After the Hyksos were expelled from Egypt, Manetho reports that they wandered the desert before establishing the city of Jerusalem. While Josephus cites Manetho’s history associating the Israelites with the Hyksos, many modern scholars see problems with Manetho’s conflation of the expulsion of the Hyksos and the Biblical narrative. Manetho lived many centuries after these events took place, and he may have combined two different narratives, wittingly or unwittingly, when associating the Hyksos and Israelites. Ahmose’s defeat of the Hyksos occurred centuries before the traditional date of the Exodus. In addition, the basic premise of the Hyksos and Exodus histories differ: the Hyksos were expelled rulers of Egypt, not slaves, and they were forced out, not pursued. Learn more about the fortress excavated at Tel Habuwa—the largest discovered to date in Egypt. The expulsion of the Hyksos may not have been a single event, and many still read Manetho’s texts on the Hyksos expulsion as a record of the Israelites’ Exodus. After the Hyksos were defeated by Ahmose, some Hyksos people likely remained in Egypt, perhaps as a subjugated class. The Egyptian Queen Hatshepsut (1489–1469 B.C.E.) recorded the banishment of a group of Asiatics from Avaris, the former Hyksos capital. While this second expulsion would still have been centuries before the traditional date of the Exodus, there may exist parallels between these events and the Exodus narrative, or the earlier Biblical accounts of Abraham, Sarah and Lot’s own expulsion from Egypt in Genesis 12:19. Read more about the discoveries at Tel Habuwa. Watch full-length lecture videos by top Exodus scholars, including Hyksos capital excavator Manfred Bietak, online for free. James K. Hoffmeier, “Out of Egypt,” Biblical Archaeology Review, January/February 2007. Jack Meinhardt, “Look on My Works: The many faces of Ramesses the Great,” Archaeology Odyssey, September/October 2003. Hershel Shanks, “An Ancient Israelite House in Egypt?” Biblical Archaeology Review, July/August 1993. Aharon Kempinski, “Jacob in History,” Biblical Archaeology Review, January/February 1988. Overview: And the remaining Canaanites sans their Pharaoh must-have-been-expelled in the following decade…. Most people of the generation today know that the Bible was rewritten to suit racist world views and after the council of Nicea, when European Rome stole Christianity from the Copts of Egypt, they immediately white washed the Bible demonizing Egypt and Africa in the process, unknowingly to a lot of Africans who they would later bring this rewritten version to. The so called Hebrews or really Hyksos, were actually expelled from Egypt, between 1491 and 1480BC and the final remnants a little later and as written records have shown, Ahmose who is Moses(Greek), was the Egyptian pharoah that expelled them. As a matter of fact during this time there was a series of pharoahs with the name Mosis or Moses, I.e.Thutmose or Thutmosis etc. I possess a Bible that gives the dates of historical events and in this Bible, the dates of the so called Exodus, and the hiksos expulsion correlate exactly, so whoever wrote this article, they are obviously lying, maybe they are trying to cover something up! 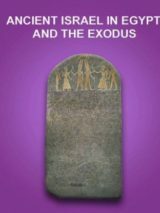 The author presumes Manetho was writing of the Jews and that the biblical myth of the Exodus was the source of his tale, rather thwn the other way around. The Hyksos very likely formed some element of the later Exodus mythos, but rather than Israelites/Hebrews/Jews as the sacred victim of Bible narratives, the truth was expulsion – not flight, and a hostile elite status, not slavery. I’ve often wondered if the exiled Israelites fell victim to increasing anti-Asiatic prejudices and oppressive laws in the centuries following the defeat of the Hyksos by Amhose. The Bible records that the Israelites were economically valuable to the Egyptians yet the Egyptians forced more and more oppression on them. But it looks to me that “Pharaoh” was pre-occupied by some other matter when the Israelites were preparing to leave. It seems to me that the complaints of a despised population mattered little to none to him and the Exodus, when it finally happened, surprised him. What else could have been going on at that time to distract “Pharaoh”? Tension between the Egyptians and another nation would be more likely than outright war as “Pharaoh” expended military resources to try to bring the Israelites back. What about the idea, and it seems at a minimum worthy of consideration, that the writers of Exodus, ALSO writing centuries after alleged incident(s) – essentially Orwellized Manetho? Does this mean that Cecil B. DeMille has to give his Oscar back? Why is everyone so afraid of what might be the real truth, as written by Manetho that the Israelites were unclean Egyptian (lepers) who while in Avaris asked the Hyksos to do battle against the Egyptians and failed. In the process they were made to leave Egypt with the Hyksos to Jerusalem which was the former home of the Hyksos. It might also explain the reason for wandering in the desert for so long being that they had lepers upon them. somebody is lying about bible history and the Hyksos. Anat is the goddess that ties all of this together.Anat was worshipped by the Hyksos in Egypt and in Palenstine at the same time.Anat was so beloved by the ancient Jews that she was still worshipped by the Jews in Elaphantine after the Exile.There is also a connection with the Pharoah Ramsses.He loved the goddess so much he built temples for her and named his dog his and his daughter whom he married after her.These people went back home after being ran out of Egypt.Connect the dots Anat is the key too the whole thing. This is what baffles me about the Exodus story.This is also why I think Haribu and Hyksos are the same ancient Hebrews.The Bible says the Hebrews left Egypt peacefully.Then the Pharoah all of sudden had a change of heart and wanted to chase them down and kill them.It makes no sense whatsoever.It makes more sense that these people were ran out of Egypt.The pharoah probably sent a legion behind them to make them get the hell on.This is the truth that became Bible legend.Common sense is lost on all this so called Bible experts. >>with themselves de-glorified as slaves? Because it is much easier to see a sob-story of persecution – those horrible Egyptians who persecuted us, but we survived the persecution. Think of selling the real story. We were a strong nation with the best technology, but we were still beaten by the Theban Egyptians. Although they did pay us to go. Which social history brings the people together the best, and preserves the nation? It is clear that the Israelites were the Hyksos, just as Josephus Flavius says (why would he say it otherwise?) The more interesting aspect is that the Hyksos-Israelites may have gone back to Egypt (the Joseph return to Egypt) and risen to power once more under the Amarna dynasty. But they were beaten and exiled on yet another Exodus. This is why the Judaic god is called the Adon – the same as the Aten god of Amarna. See ‘Tempest & Exodus’. For example, if you google “ancient Egyptian history” you’ll find almost as many different timelines for Egypt’s pharaohs as you’ll find websites on the subject. According to one, Egypt was first settled about 3,500 B.C.E. But according to another, farmers were plowing the Nile valley by about 5,000 B.C.E. – a disagreement of 1,500 years. And still others claim Egypt was populated 40,000 years ago. Since there are no reliable records from any of these countries, what is “known” about them is in actuality simply the ‘best guess’ based on hieroglyphics, scraps of papyri, and stories written long after the fact. There are huge gaps in the records – in some cases, multiple centuries. The royal scribes were not so much historians as strokers of their mentors’ egos. They grossly exaggerated victories and minimized or completely ignored defeats and failures. They also skipped over unpopular kings. Many of the stone-carved ‘histories’ are actually carved right over the histories of their predecessors. And nearly all these timelines include gods, demigods, and myths treated with the same validity as historical figures – like saying the early presidents of the United States included Kokopelli, Pecos Bill, Paul Bunyan, and Santa Claus. I’m not happy to see Velikovsky dragged in. Immanuel Velikovsky was an utter crank whose books achieved popularity because they appealed to evangelical Christians by purporting to “prove” that the Exodus miracles all really happened exactly as described. Velikovsky imagined the planet Venus as having been ripped out of the planet Jupiter within historic times and then bouncing this way and that around the solar system, causing miracles on Earth along the way, until it finally settled into its current orbit. Leaving orbital mechanics out of it, one would expect that if Venus were a chunk of Jupiter, its chemical composition (certainly that of its atmosphere) would match that of the giant planet. It’s not even close: Jupiter is a gas giant composed chiefly of hydrogen and helium, with (possibly) a solid core tens of thousands of miles beneath its atmosphere, while Venus is a rocky planet with a dense atmosphere of CO2 and nitrogen. Putting orbital mechanics back in, it’s physically impossible for Venus to have done what Velikovsky described. Yes, modern theories of the formation of the solar system do describe a chaotic early period in which huge masses of material moved in random orbits, slowly accumulating by collision and under gravitational and tidal forces into the bodies we see today–but that was billions of years ago, not during the reign of the pharaohs, and took many millions of years. It amazes me how ignorant are people who wrote most of the above comments. If they would read the Hebrew Bible and then read Velikovsky they would know that the Hyksos/Amu/Amalekites were most certainly NOT not the Israelite. It is clear to anyone who reads instead of just writing anything which come into their “minds”,. they would see that at the same moment as the Israelites were escaping from Egypt in the Exodus they were cowardly attacked from the rear by the Hyksos/ Amu/Amalekites. The Israelites were heading AWAY from Egypt while the Amalekites/Hyksos were heading TO Egypt. That gives the relative direction of movement as well as the chronology. Incidentally, who says that the Israelites were illiterate? They were NOT slaves but BONDMEN in much the same way as mediaeval serfs were in Christian Europe 3000 years later. Earlier, Joseph was the Household Manager so must have kept accounts. Some of the bondmen worked in quarries, others probably in architectural offices and were surveyors. They – or many of them – were literate. 400 hundred years later The Ten Commandments were WRITTEN on stone for all to read as well as to hear. The Bible began to be written so that fathers could teach it to their sons. That was long before it was canonised. The date, incidentally, of the Exodus was 1550 BCE and the date of the overthrow of the Hyksos/Amalekites was some 400 years later under King Saul. READ ALL ABOUT IT before writing your uninformed comments. The ‘traditional’ date of the exodus is somewhere between about 1450 bce and 1650 bce, depending on how one treats the chronological references. It bothers me that an otherwise reputable source would refer to the very modern 1200’s date for the exodus as if it’s ‘traditional’ rather than a modern scholar’s hypothesis (and a poor one at that, as it matches neither the ancient supporting documents nor the archaeology). I’m still not sure why folks are repeating what the bible is saying about that time as valid history. It’s revisionist and like Beaver has said and what most scholars agree on is written much later. The Exodus story was written almost 1,000 years after it happened. Slavery in Egypt was a byproduct of not having a prison system to house criminals and POWs. The pyramids were built more than a thousand years before the hyksos invasion. This is my theory. The semites in that picture were arrested for aiding foreign invaders. They were enslaved for a period to work in the mines. They revolted and left. They later founded the Abrahamic faith but they were illiterate so they didn’t write anything down. They just told the story and over the years the story changed. By the time they wrote the stuff down they propagandized themselves as slaves who built the pyramids and were liberated by god through while a series of real plagues and turmoil distracted the Egyptians long enough and well enough to help them escape. The Hyksos in studies today show they were and or related to the ancient Armenians and this is where the Hebrew race originated, in the Armenian Highlands. The Hyksos (Hebrews) were both rules and slaves. There were rulers such as Joseph and Moses in Egypt. I just wanted to say — HAYQ/HAYK was another name of Armenian Kingdom (greek) they called them HYQSOS because they were from HAYQ/HAYK (Armenia). Today Armenians call each other HAY in honor of HAYK/HAYQ Father of Armenians. Moses is like Tuthmoses, Ahmoses, Kamoses, or Ra-Moses( Rameses), which means ‘Ra is born’. You missed my point so I will make it again, The Amalekites are mentioned in genesis 14 which discusses the battle of four kings, at the time of Abraham and Lot, and so Esau’s grandson would have been Abraham’s great great grandson, so how could the Amalekites be descended from Esau? It is moribund stupidity. The Amalekites in Samuel were portrayed as living about the Negev. Trying to say that they were in Egypt post 1500 BC is pure speculation. The Talmudical myths ignore the chronology of the Bible. The Rabbinical tradition of Amalek is a deeply racist one, ill founded and clearly advanced by Jewish race supremacists/Zionists who want an excuse to treat Gentiles as sub-humans. There is no connection to Haman from the Book of Esther. All the earliest copies of Esther say Haman was a Bugaen not an Agagite. The idea of separate races was invented by the Gnostic Basiledes in the second century AD. The idea in the Rabbinical writings that Gentiles are ‘animal people’, is from Greek Paganism, not Judaism. So the first will be last and the last will be first. God blessed Abraham in order to bless the Gentiles, he did not have genocide, extortion, slavery, usury, prostitution, drug addiction, pedophilia, organ-harvesting of innocents in mind at all. The Bible says that all men are brothers, and with your evil inventions you try to distort the word of God to serve your utter wickedness. The name Moses given to him by a non-Jewish woman is probably a Semitic word but then how on earth was a Semitic the language spoken in the pharaoh’s household? Did the Amalekites/Hyksos seize power in Egypt even before what Dr. Velikovsky calculates? Bible does say that Amalek descended from Esau. Here is the quote for you. I have to say that it appears to me that people who support “Amalek=Hyksos” theory are much more bible literate, able to think for them selves and less anti-Semitic. The identification of the Hyksos with the Israelites, seems fairly obvious. The chronology, arrival in Egypt after 2000 BC, about 400 years, then the exodus/expulsion (depending on ones point of view) circa 1500 BC, agrees with the 400 years in Egypt, and the 480 years from the Exodus to the building of Solomon’s temple. The theory that the Hyksos were Amalekites is more or less insane because by all accounts the Hyksos period ended shortly before the Exodus. That apocryphal Amalekite-Hyksos rule must have occured during the time of Joshua and the Judges, and there is exactly no evidence for anything like it, that time period was the New Kingdom, and the resurgent Egyptian rule under the 18th and 19th dynasties. On could suppose that the Hyksos were Amalekites if they came around the time or after Joseph, but they are in stiff competition with other cantidates, like the Hurrians, Kassites, Hittites, Amorites, Philistines, etc that are advanced by different groups depending on their philosophy. The theory that the amalekites were descended from Esau is Rabbinical nonsense. It is not in the Bible it is read into the Bible. they were in genesis 14 at the time of abraham, so how can they be descended from his great great grandson? Esau’s grandson was named after the Amalekites. Not vice versa. The three Hyksos dynasties (XIV, XV, XVI) ruled Egypt approximately from 1750 to 1530 BCE and then disappear abruptly after the death of Pharaoh Seqenenre Taa. One can notice that Egyptian documents unanimously describe the departure of the Hyksos from Egypt to Palestine in a disaster. Modern Egyptologists pictured a ‘war of the Hyksos’, however no document speaks of war but only that Avaris, Hyksos’ capital, was looted and vandalized after their departure. Moreover all accounts of former historians picture the Hyksos as the ancestors of the Hebrews, led into Palestine under the leadership of Moses. In addition both biblical and Egyptian chronologies date the Hyksos departure in 1533 BCE, which implies the coincidence of these two dramatic events. The only way to date the so-called “Hyksos’ war” is: gathering all historical and archaeological documents about the Hyksos, establishing a relative chronology of the “Hyksos’ war”, identifying who was Apopi and his links with the biblical Moses, determining from where came the Hyksos and where did they go, dating the Hyksos war according to the Egyptian chronology through synchronisms dated by astronomy and dating the Exodus according to the Israelite chronology (based on masoretical text) checked by absolute dates. According to Egyptian accounts the last king of the XVth dynasty, named Apopi, “very pretty” in Hebrew that is Moses’ birth name (Exodus 2:2), reigned 40 years in Egypt from 1613 to 1573 BCE. 40 years later Apopi met Seqenenre Taa the last pharaoh of the XVIIth dynasty and gave him an unspecified disturbing message. The eldest son of Seqenenre Taa, Ahmose Sapaïr, who was crown prince died in a dramatic and unexplained way shortly before his father. Seqenenre Taa died in May 1533 BCE, after 11 years of reign, in dramatic and unclear circumstances. The state of his mummy proves, however, that his body received severe injuries and remained abandoned for several days before being mummified (see Psalms 136:15). Prince Kamose, Seqenenre Taa’s brother, assured interim of authority for 3 years and threatened attack the former pharaoh Apopi, new prince of Retenu (Palestine). In the stele of the Tempest he also blames Apopi for all the disasters that come to fall upon Egypt which caused many deaths. Jerusalem was a city with a thousand year history when the Jews conquered it. It is stupid to of them to be cited as ‘founding’ Jerusalem. Two key pieces of information in the Bible serve as clues pointing to the identity of the Hyksos with the Amalekites. One is the finding of an Egyptian, servant to an Amalekite, in 1 Samuel 15. What is an Egyptian, son of the powerful nation of Egypt, doing as a servant to an Amalekite, of a relatively weak nation? But this would make sense if the Amalekites were the Hyksos who ruled Egypt, for then it would have been normal for Amalekites to have Egyptian servants. Velikovsky discussed this in his 1952 ‘Ages in Chaos’. Second is David’s conversation with a young man who identifies himself as the son of a stranger [foreigner or alien], an Amalekite (2 Samuel 1:14). This young man does not need to call himself a foreigner; it is obvious that he is a foreigner if he is an Amalekite. However, the Hyksos were known as Foreign Rulers or Rulers of Foreign Lands. His identifying himself as a foreigner may have been a way of saying that he is one of the Hyksos. These two clues point to the need for a revised chronology in which Hyksos rule in Egypt is down-dated to roughly the late second millenium BC. As The Encyclopedia Americana (1956, Vol. 14, p. 595) says: “The only detailed account of them [the Hyksos] in any ancient writer is an unreliable passage of a lost work of Manetho, cited by Josephus in his rejoinder to Apion.” Statements attributed by Josephus to Manetho are the source of the name Hyksos. Interestingly, Josephus, claiming to quote Manetho verbatim, presents Manetho’s account as directly connecting the Hyksos with the Israelites. Josephus, it seems, accepts this connection but argues vehemently against many of the details of the account. He seems to prefer the rendering of Hyksos as “captive shepherds” rather than “king-shepherds.” Manetho, according to Josephus, presents the Hyksos as conquering Egypt without a battle, destroying cities and “the temples of the gods,” and causing slaughter and havoc. They are represented as settling in the Delta region. Finally the Egyptians are said to have risen up, fought a long and terrible war, with 480,000 men, besieged the Hyksos at their chief city, Avaris, and then, strangely, reached an agreement allowing them to leave the country unharmed with their families and possessions, whereupon they went to Judea and built Jerusalem.—Against Apion, I, 73-105 (14-16); 223-232 (25, 26). I place Joseph becoming vizir under Ahmose I after he ousted the Hyksos (which means “foreign rulers”). I think the Hyksos were miners originally from Byblos, who desired home cooking and so they became shepherds. Since the southern Egyptians were oppressed by these shepherd kings, they hated shepherds. Joseph made a point of this to his brothers when they arrived. Also, Tell el-Daba (Avaris) has dozens of large temporary silos after the conquest of Ahmose I.
I place Rameses I as the pharaoh of the exodus. I am happy to see others citing Velkovsky, as his research of other civilizations from around the world, proves that a major cosmic disaster happened circa 1495 BCE. This is the date of the Exodus, when the Israelites left Egypt, as can be calculated by working back from 587/6 BCE – the known date of the Babylonian conquest of Judah. As previous posters have said, this disaster allowed the Hyskos [Amalekites] to take over Egypt. I think things are very clear Abraham left Babylonia because of his discrepancies regarding idol worship with King Nimrod because he was a Noahide that followed the seven laws given by God to Noah after the deluge. He left with Eliezer the Babylonian King son with could be interpreted as a support of the King to Abraham because nothing happened in Babylonia unless approved by the King that was very powerful, Then he goes to Canaan current Palestine and descends to Egypt for food telling the Pharaoh that Sarah was his sister after discovering the truth he asks Abraham to leave the country and gives him Aghar his daughter as his maid servant, having a son with her Ishmael. So the two most powerful Kings of the world gave him his son and daughter respectfully that could mean that they supported him in his mission of spreading the seven laws of Noah in all the region. The Amalekites descended directly from Amalek the son of Timna that was rejected by Jacob and that had to marry her father where the hate against the tribes of Jacob began and then when they left Egypt under the leadership of Moses that was a Pharaoh probably Aknaton that changed the Egyptian religion from polytheism to monotheism was ambushed by them. IF the Hyksos were “Shepherd Kings” and the Egyptian memory of them being traumatic, perhaps this is the source of the mistrust that the Egyptians had for the Hebrews under Jacob that Joseph seemed to mention when the Egyptians ate seperately from the Hebrews. When Moses and the Israelites left Egypt (The Exodus) they were travelling roughly eastwards. The were attacked by the Amalekites (Arab tribal group) travelling westwards towards Egypt. They were Arabs from Arabia and were the the Amalekites called Amu by the Egyptians but later called Hyksos by the Greeks. They were able to enter mighty Egypt and take over simply because Egypt had just been laid waste by the Ten Plagues – the same disasters which allowed the Israelites to flee Egypt. Dr Velikovsky has explained all this 50 years ago in his book “Ages in Chaos” . Ahmose was “the Egyptian Prince” who was an ally of King Saul when he besieged Avaris (el-Arish). As a result, Egypt and Israel were allies for a very long period. The Philistines were foreign to the area and were allied to the Amalekites and lasted longer before being finally defeated by King David and being absorbed into the Israelite people. The Hebrew period of “Judges” was the same period that the Hyksos ruled Egypt.. Queen (Sheba) Hatshepsut was a contemporary of King Solomon who visited the “Wise King of Punt” (Holy Land) and became his lover and whose son became Regent of the Egyptian province of Ethiopia and that dynasty lasted until well into our own lifetime. That dynasty bore the title of Lion of Judah even though they became Christians. If you get the dates all correct then you will have various histories co-ordinated and synchronised with the Hebrew Bible. Why would a ruling or elite nation falsify a history with themselves de-glorified as slaves? And why would The Egyptians record a slave nation as rulers/elites? Maybe the second question could be answered, but the first seems more difficult. Maybe recording slaves as powerful would lessen the embarrassment of a defeat or loss of a slave population. Maybe even the first question could be made to agree with the Bible if it was referring to the beginning of Israelite settlement, as the first Pharoah is described as honoring them. I just thought you might find this interesting. I think Yoram makes a good point. What I would like to know is, which God did the Hyksos worship? I also read somewhere that the great pyramid in Egypt was built by the Hyksos as an alter to YHWH. I have been reading lately about biblical characters originally being Egyptian, if there is any truth in this, then this is where it may have originated from. After all Moses did rule in Egypt and so did Joseph, it’s a very interesting discussion. The expulsion of the Hyksos is a MAJOR event in Egyptian history. Whether it coincides precisely with the Thera eruption or not, it nevertheless presents a milestone event in the history of that people. There is simply no other event on record that could be identified as the actual Exodus of the Bible without resorting to all sorts of apologetics. The Exodus described in the Bible is not some minor slave revolt or rebellion. It is not an event that could be categorically ignored by later Egyptian historians and chroniclers. To be the Exodus of the bible it has to be a major, epoch shifting event for the Egyptian State. Having said that – the real question is in understanding the relationship of the Israelites to the Hyksos. The term Hyksos has been loaded with derogatory connotations since it was first mentioned in the classical literature. There is obviously a reluctance to associate the cursed Hyksos with the pure lamb of Israel. But we need to see beyond that. Eventually these pastoralists outnumbered the local Egyptian population, a struggle ensued and these pastoralists became the new masters of Lower Egypt. These pastoralists, however, did not remain pastoralists, but rather, they became thoroughly Egyptianized. The Hyksos (ie shepherd-king/foreign-king) state was built on the exact same principles as the 12th Dynasty state – one based on the mass enslavement of the population to a supreme central authority. The slaves of the Hyksos regime were obviously, from amongst the descendants of the original migrants – the same origin as the ruling class. ie – the “Israelites” were both the evil Hyksos rulers and their poor oppressed slaves. Because more than a history – the Bible is politics – and revolutionary politics at that. It is at its core an argument for a different mode of social organization – and Egypt sits as the paradigm of the most despotic system imaginable. The slavery that the Bible describes in the Egyptian system is not really some special situation in Egyptian history – rather – it is the default position of Egyptian history. the slide of the Israelites into slavery, while depicted as a vicious and calculated plot of an evil mastermind, was actually the inevitable result of remaining within the Egyptian society. With each passing generation the community becomes more assimilated and beyond the loss of so called cultural values – language, dress, etc, comes the streamlining into the bureaucratic state machine. Which means a few individuals will become the ruling landed class, and the rest will be sold off their land into permanent destitution. That is the slavery that the Bible describes. That is the mode of social organization that the Bible’s legal structure years to overturn. Josephus left us vast amounts of information and it is not reasonable to reject it altogether. However, he and Manetho seem to have been wrong in conflating the Hyksos with the Israelites. The Hebrews were apparently slaves in Egypt; the Hyksos were rulers/elites. The Hebrews seem to have left Egypt during a time of extraordinary natural disasters; the Hyksos seem to have entered Egypt during the same time of catastrophe–the blast of divine or heavenly displeasure mentioned by Manetho-Josephus. This would explain how the Hyksos took over Egypt–they took advantage of Egypt’s weakened condition. I suggest reading ‘Ages in Chaos’ by Velikovsky (a great pioneer, despite his errors) to see many reasons for identifying the Hyksos with the Amalekites. Early Islamic historians mentioned Amalekite pharaohs of Egypt. The dependence on Josephus, I suspect is a big problem in solving the massaged and kernel promoted by modern Biblical Archaeology. It might have sufficed for 1st century AD scholars and perhaps those up to the 20th century, but in the 21th with so much more archaeological evidence and understanding. I can’t accept any work that is promoting history according or referencing Josephus, I am sorry. Manetho’s misidentification of the Hyksos with the Israelites is one of the ancient origins of anti-semitism. We don’t know where the Hyksos went, and maybe they were Amalek. But they certainly didn’t go to Jerusalem.